Anyone who has been around my son for 5 minutes has likely witnessed his obsession with airplanes. As I write this there are 9 airplanes in view just in my living room. I'm pretty sure Dusty from Disney's Planes is his BFF. Realistically, his first birthday theme was mostly for me. It was adorable, but he had no clue what was going on. This year it was fun to do something for him. By the number of times he exclaimed 'airplane!' during the course of the party, I'm going to say it was a big hit. 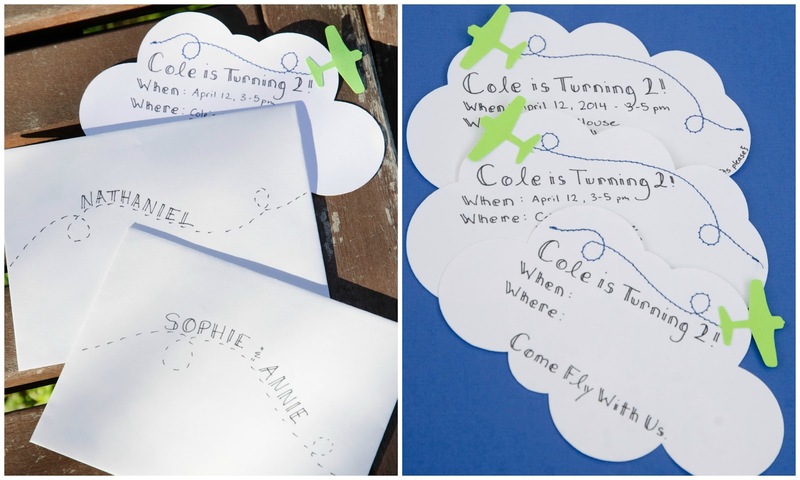 The decorations for this party all started with the invitations. I loved how they came together - the clouds, bright colors, and sewn airplane trails. I decided to carry the same look throughout the entire party. We have two big trees in our backyard - perfect for hanging lots of clouds, airplanes, and '2's on blue ribbon (as well as a special surprise, but I'll get to that in a minute). 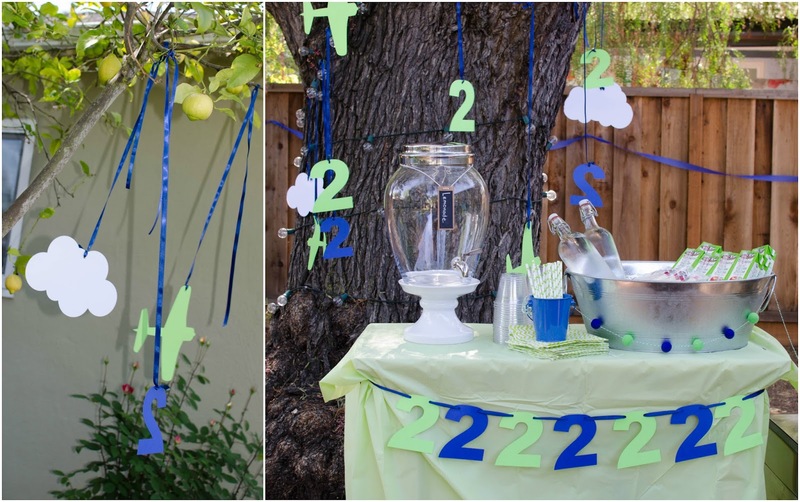 A blue and green '2' garland decorated the drinks table and a string of felt balls livened up the galvanized drink tub. Above the dessert table an airplane flew a Happy Birthday banner in front of a green streamer backdrop (which took quite a beating on an unusually windy day! 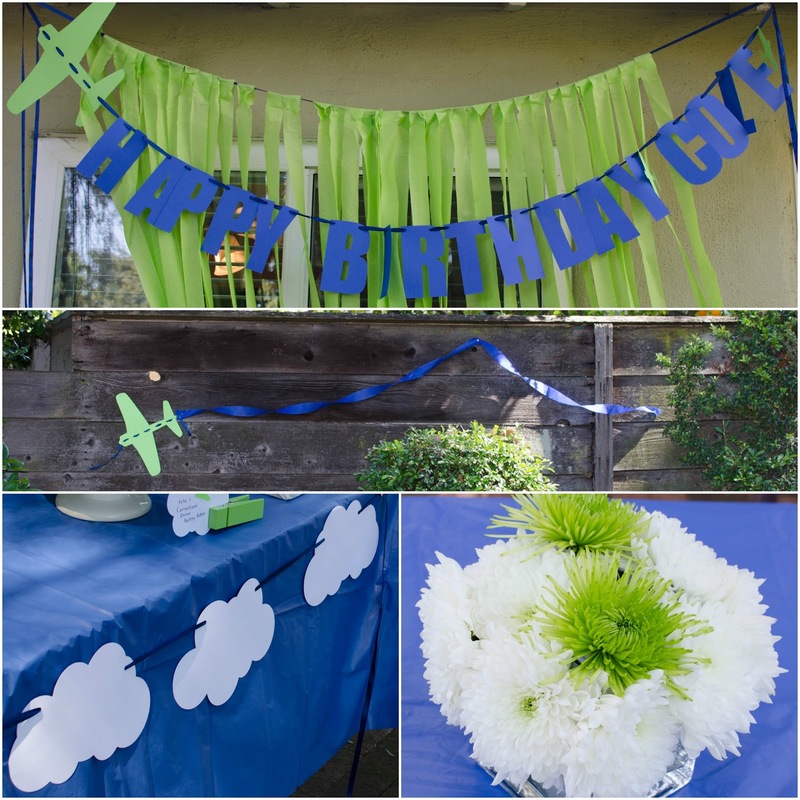 ), while a white cloud garland stood out nicely against the blue table cloth. Our yard is bordered by a (we'll call it 'rustic') fence, which allowed plenty of space for more big green airplanes and blue streamer flight trails. White and bright green mums looked perfect against the blue tables. And, of course, we had a very special guest appearance by the one and only Dusty Crophopper. I don't purchase many party decorations, but when I do I make sure they are ridiculously adorable. This piñata was by far the highlight of his little day. As the guests arrived, he ran up to them shouting 'Dusty!' and brought them to see his special piñata. Thankfully, it was opened by a pull string which kept it from being destroyed. Otherwise, we may have had a full blown 2 year old meltdown. For the final touch to the decorations, I got my husband involved. 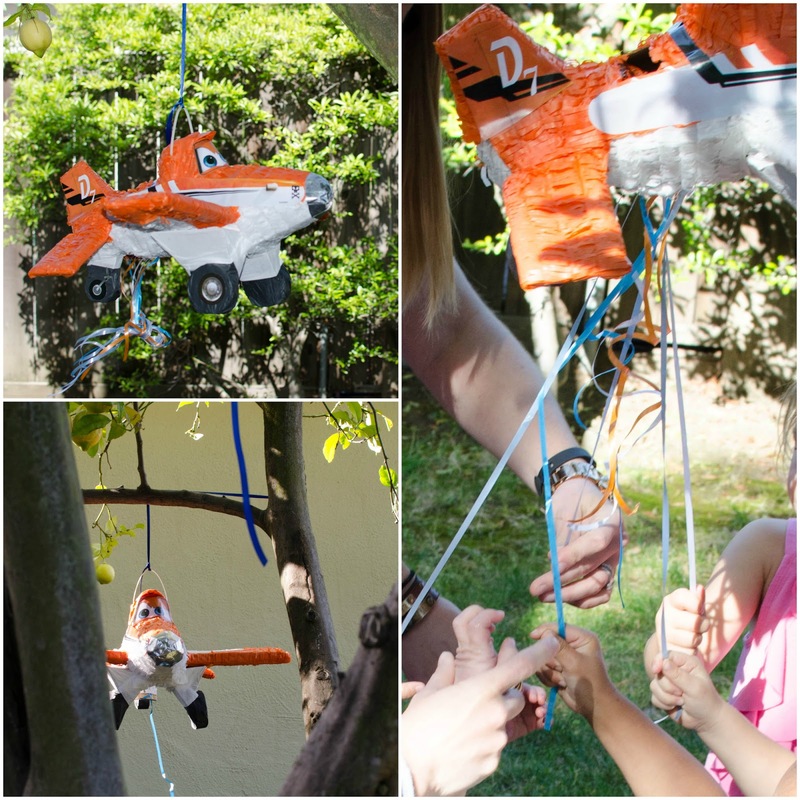 He keeps telling me that he is not 'crafty', but these airplanes beg to differ. Maybe it was just enough 'engineering' to keep him intrigued. And the propellers even spun. Ridiculous. It is pretty amazing what he can do with some spray paint and old amazon boxes on short notice. I've got a keeper, ladies. The birthday boy liked them quite a bit. The desserts for this party theme were only too fun to make! I'm in love with his cake. It turned out just how I pictured in my head (which does not always happen). On a funny note, the birthday boy hated it. Well, technically we couldn't even get him to try a bite. He instead preferred an airplane cookie. He sure did love poking holes in the fondant though! I wasn't too upset about it - we were all only too happy to finish the cake for him. I decided to make a smash cake again. I used two 6" cake pans and my favorite Mexican Chocolate Cake recipe. 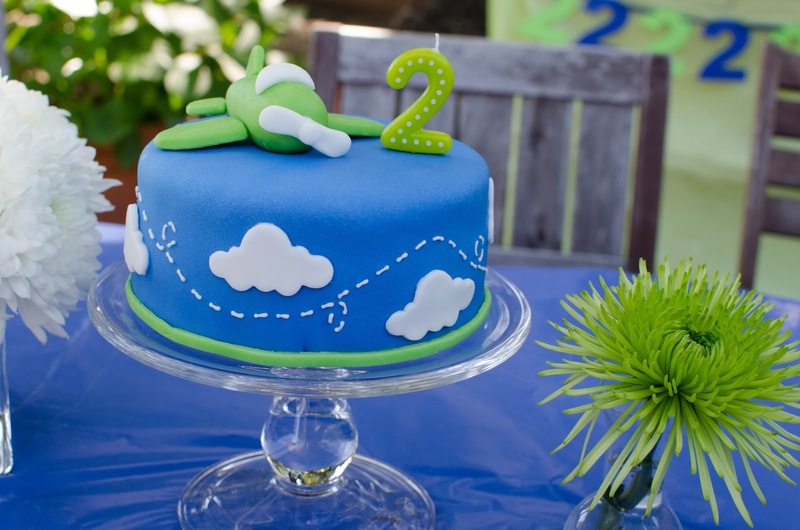 The cake was covered first with blue fondant, then the green fondant strip along the bottom and the white fondant clouds (cut with a cookie cutter) were added with a little gum paste 'glue'. 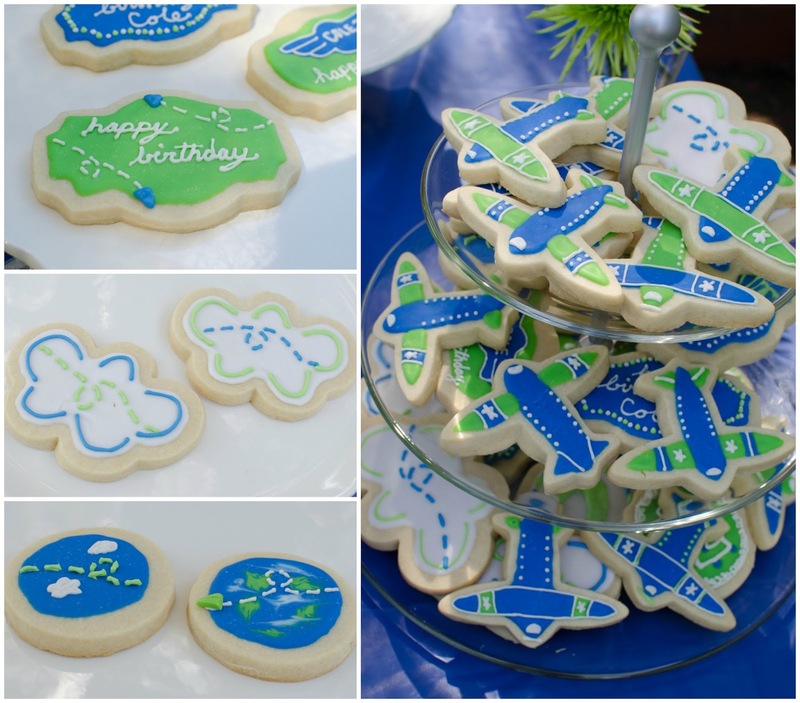 I used white buttercream icing from the sugar cookies to pipe the flight trail along the sides. 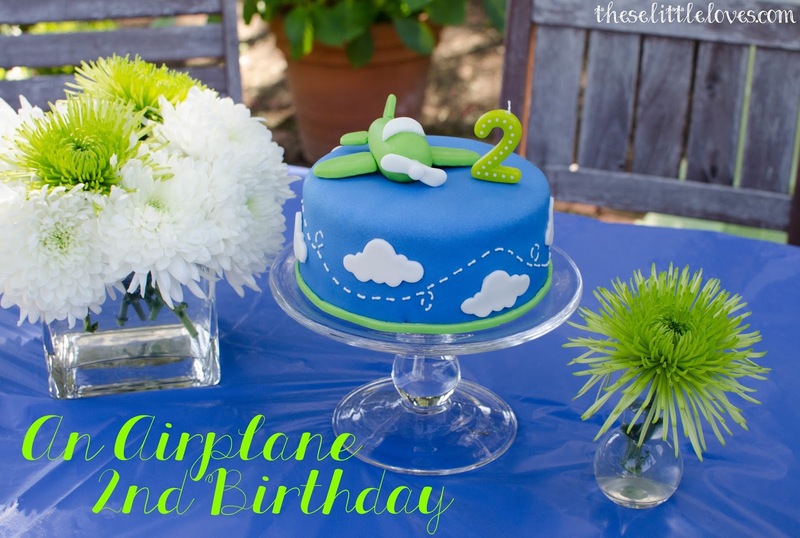 About two weeks before the party I had made the green fondant airplane in pieces. I was so nervous to assemble the pieces the day of the party! I would recommend putting toothpicks cut in half in the wings and tail, This way when you assemble the plane you can just poke the toothpicks into the plane body. It worked pretty well. With a little icing to stick on the windshield and propeller, we were in business! With the primary cake being a smash cake, the rest of the guests needed something to eat during cake time. My sister-in-law had gifted me a cake pop maker for Christmas and I figured now was a perfect time to try my hand at the whole cake pop thing. Let's just say it did not come naturally to me. 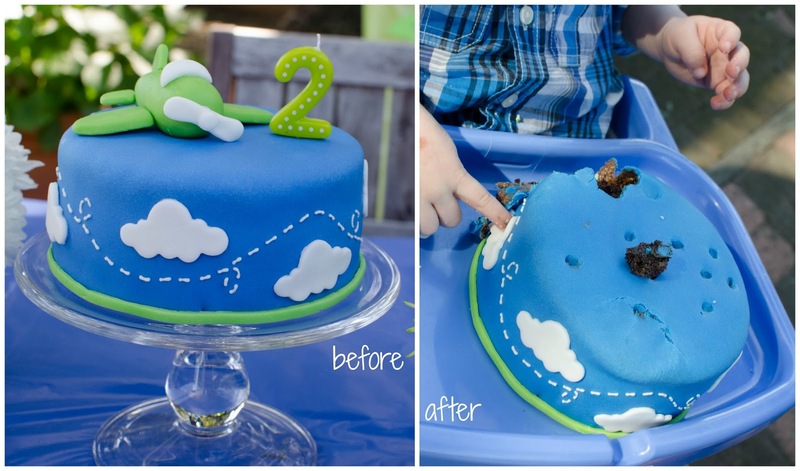 I had a few true 'pinterest fail' moments, but in the end they turned out cute enough! I used the same cake batter from the smash cake and coated the pops with Wilton candy melts in green and blue. 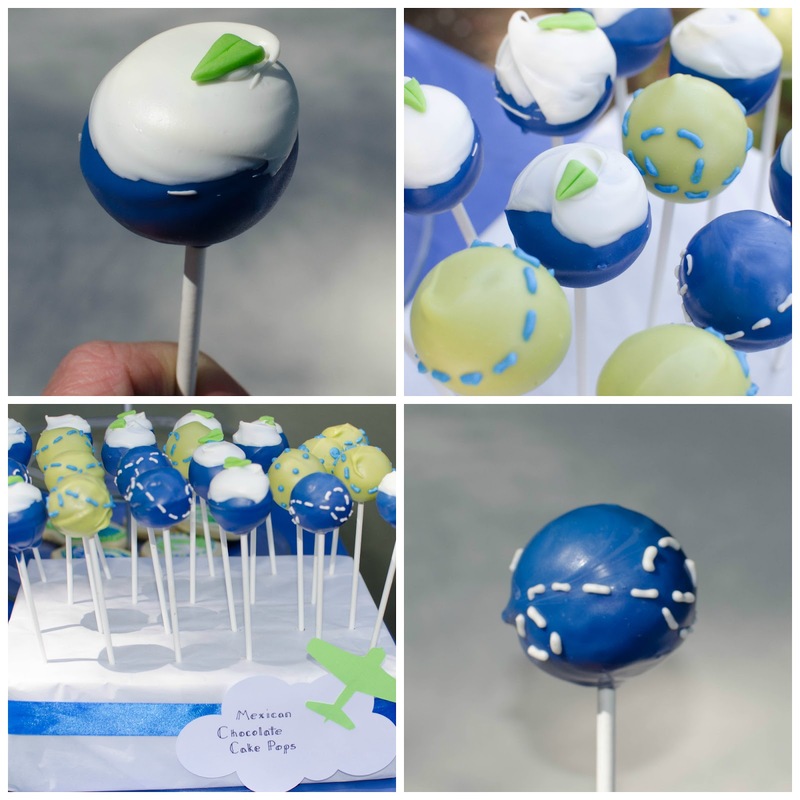 After the coating was dry, I swirled some of the cake pops in white candy melts for 'clouds' and added tiny green fondant airplanes with a dollop of frosting. The rest of the pops got piped flight trails in contrasting colors. I don't have a fancy cake pop stand, but instead used a few blocks of florist foam covered in tissue paper. I'm pretty sure the favorite dessert of the day, however, was my sugar cookies (mentioned here). Using only four cookie cutters (see sources list below), we had airplanes, clouds, flight trails, and pilot wings in several forms. I primarily used glaze icing in green, blue, and white, and then added decorative touches with buttercream icing (also in green, blue, and white). I think the airplanes are my favorite. 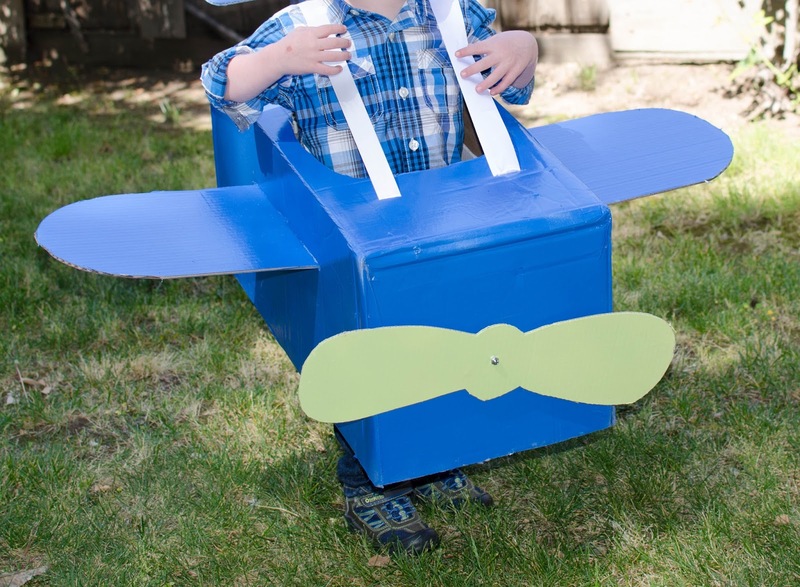 To thank all the little guests for coming to celebrate with us, we sent them home with airplane themed favors. 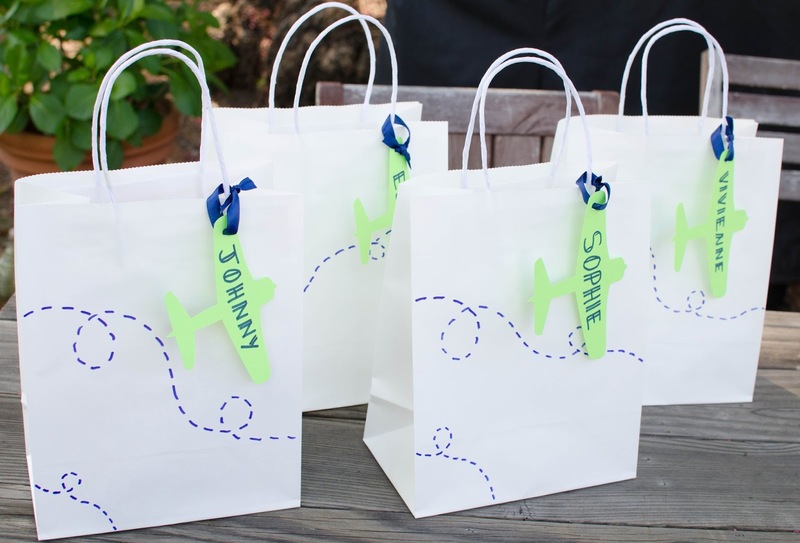 I bought some inexpensive white gift bags and added the flight trails with a blue marker. The airplane tags were cut with my Silhouette Cameo and attached with blue ribbon. Most of the guests got my son's favorite airplane book (and by favorite I mean that we read this book at least 3 times a day at his request - I have it memorized), a parachute man, glider, and airplane temporary tattoos. However, we had two very special 'new arrivals' in attendance. 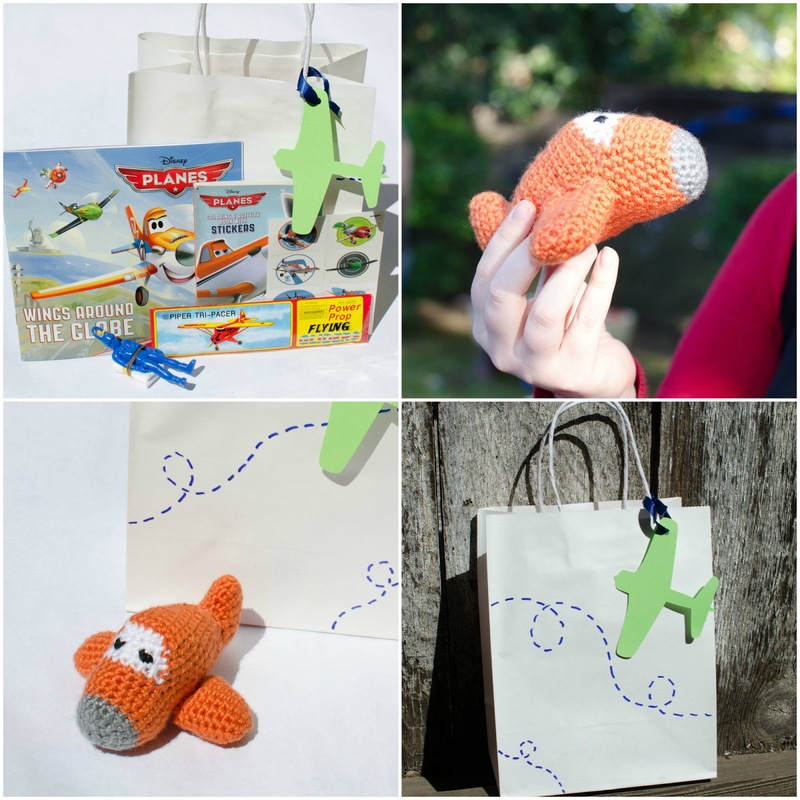 These new little guys got special crocheted airplanes. Unlike last year, I did not make this pattern myself, but found it on Etsy (source link below). 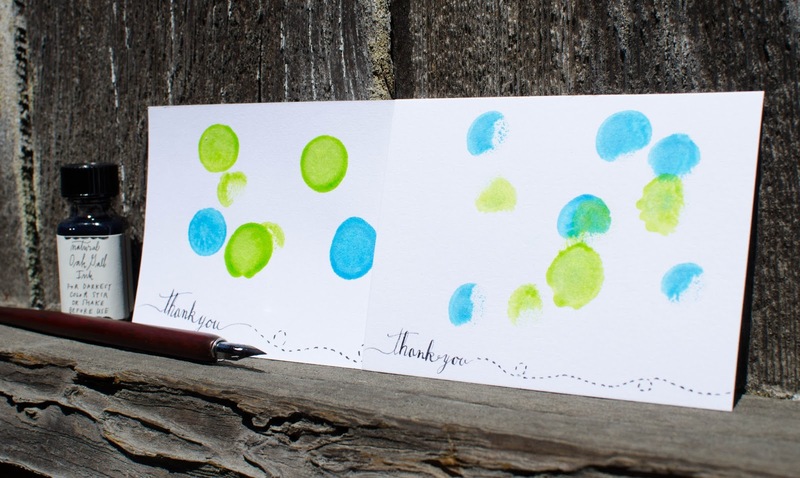 And finally, the thank you notes. Just like my Easter cards, I'm a big fan of getting the little ones involved in correspondence. At this age that means that he helps me 'decorate' the cards. 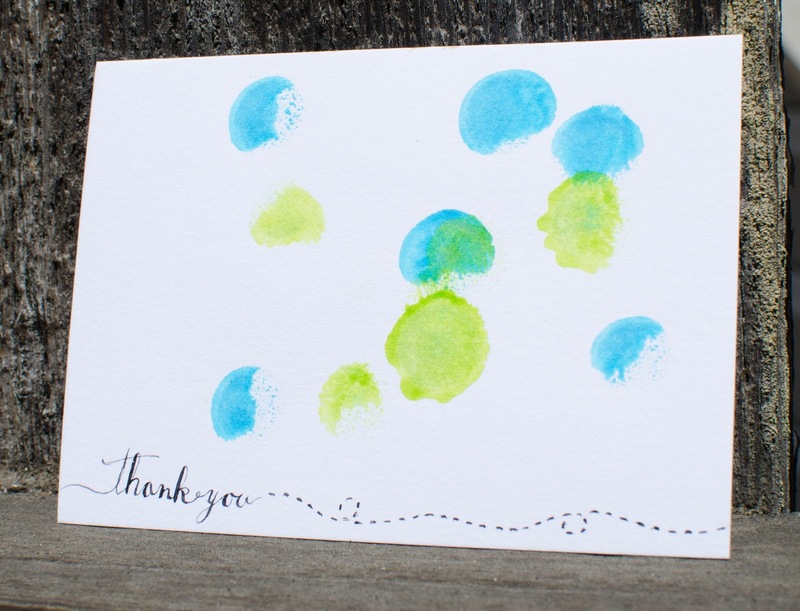 Dot markers are a perfect (less messy) answer. He gets to stamp them on the cards and I take it from there. I recently took a modern calligraphy class from Diva of Linea Carta and I've been dying to have an excuse to calligraph something! These cards gave me the perfect chance to practice. I think I need a lot more practice, but you get the idea. I couldn't help but sneak in one more flight trail on the card. So with that I say 'Cheers' to us on surviving another year of parenting. What a joy and blessing our little man continues to be. There is no sponsorship of this party or blog post, but I've provided a list of my materials if you want to do something similar. It took many hours of loving labor to make these party decorations and I just couldn't throw them away. I've decided to list the decorations that were in perfect condition on Etsy as a party pack. Hopefully someone else can get good use out of them! The Silhouette Cameo shapes used in the decorations are: wwii airplane, and 9 clouds. You are too stinkin' good at this stuff, Bethany!! Super inspiring. The cookies look (almost) too good to eat! Thanks, ladies! It was a blast to put together and I'm glad I get to share it :). Love it! We are planning a cars party. How do you do a piñata with such 3 year olds?